It is not becoming for a prydydd to dabble in material more suited to a clerwr, for such things are opposed to his art. It is the habit of the clerwr to mock and to belittle, and to arouse feelings of shame and disgrace, whereas it behoves the prydydd to praise and to compliment, and to procure fame and joy and glorification. Moreover, the clerwr practises a disorderly art which is not reducible to rule. But it is becoming for a prydydd to concern himself with material suitable for a bardd teulu and to treat it critically, for the art of the bardd teulu submits itself to rule and to the discipline practised by the prydydd. 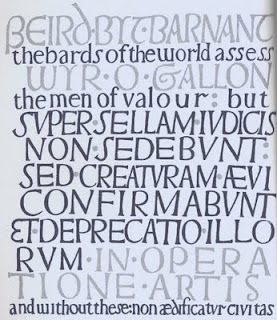 Wherever the prydydd practises his art, it is not right to entertain the disparaging productions of the clerwr for the prydydd’’s song of praise should outweigh such mean effusions. Incantations, sorcery, and magical practices are not worthy of the prydydd’’s indulgence, and he should not meddle with them. Ancient song of high repute and tales preserved in writing, questions reflecting honour on those who asked them, and replies rendered excellent by art and truth – these are the things that it is good for the prydydd to know when called upon to converse with wise men, to delight young maidens, and to entertain gentlemen and ladies of breeding. For the prydydd’’s art is a portion of natural wisdom and it is derived from the Holy Spirit, and its inspiration is a fruit of genius matched with artistic endeavour. The interesting thing here is not just that the prydydd is seen as a pillar of civilized Christian society, but that the clerwr is seen as quite other. The clerwr may dabble, potentially, in magic and sorcery, engage in satire and other ‘low effusions’ and, presumably, entertain rather than edify. If it is the works of the prydyddion that have come down to us, would it perhaps have been the clêr who had a more apparent presence for the inhabitants of the oral culture of medieval Wales?